The picturesque town of Lynmouth on the North Devon coast is well worth a visit for some excellent scenery and there is pleasant walking along the sea front and along the banks of the Lyn River which flows down to the sea and small harbour. There is also a cliff railway from Lynton village on the cliffs down to Lynmouth and the sea front. At the Lynmouth sea front there is a small shingle beach with rocks at the west of the harbour. To the east of the harbour, there is a longer shingle beach again with rocks at low tide. Steps to the west beach and on the east beach access is level in places. There are several bridges over the river, including a foot bridge near the harbour. 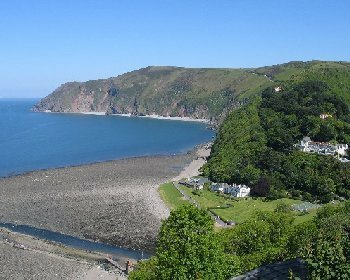 Lynmouth is about 19 miles from Barnstaple and there are various routes to Barnstaple from North Devon and North Cornwall. At Barnstaple follow the A361 over the new road bridge over the River Taw and then at the Braunton Road Junction turn right (signposted to Lynton), then turn left onto Fair View road (again signposted to Lynton) and follow this road until a left turning onto the A39. Continue on the A39 for about 16 miles until Barbrook and here turn left onto the B3234 (note this route is not suitable for caravans) and take this road to Lynton and Lynmouth. After about a mile, the road splits into two, take the left turning to park in Lynton village, take the right turning down to Lynmouth, Alternatively at Barbrook stay on the A39 to Lynmouth, note this is a longer route than the B3234. There are several car parks at Lynton and at Lynmouth there are two car parks by the river and some road parking by the river and sea front.